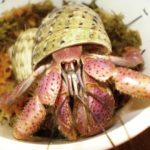 I have tried all types of dishes for my hermies and can't really find the perfect one. I have noticed the ceramic ones are difficult for smaller crabs to get into. They can't grip it. I can't find one with low enough a lip. I have tried terra cotta but those absorb wet food and are impossible to clean. And it has to be small enough because in my 40 gb there's little space. Any suggestions? I use a reptile feeding dish (made of some sort of resin) that has a natural rocky shape that all crabs can climb in and out of for my main dish. A lot of people feed food in scallop/clam shells which come in all sizes. They also range in shape from plate-like to bowl-like. They can get a little gross/stained if you leave food in them too long however. Another option are soy sauce bowls/dipping dishes (I dont know the actual name for them) that if you've ever gone out for sushi you might be familiar with. They are usually very shallow and small. My local asian grocery has a wide variety and they are great for serving small amounts of fresh food that I want to get out of the tank as soon as it starts to turn. There's also tea bag rests, those are even smaller! I use these for my big guys because they just plow on through it to eat. I use this for the Ruggie so she can't drag it around. It's tiny enough that it fits perfectly in my 29. It's really tiny though! I also use a dish similar to the ReptiRock one that Wode posted. 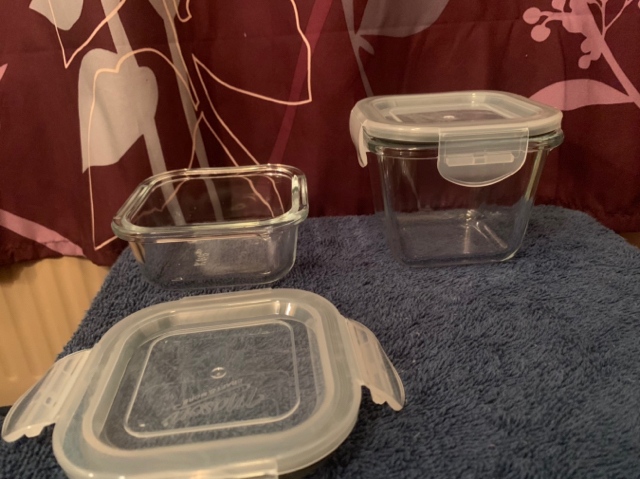 And I have about 5 or 6 of these little prep bowls in varying sizes, I push them down into the sub so the crabs don't tip them over. They are shallow enough that I don't need to worry about the crabs not being able to get in and out. I think I tried that first one and it totally absorbed water. Weired. Not that I use it for water but food would eventually not clean very well. The smaller one looks good but dish part is deep for food. That's a good idea. I'll look for a real small one. I didn't want to push anything into the ground so as not to disturb anyone down there. curlysister wrote: I also use a dish similar to the ReptiRock one that Wode posted. Am I right that they will only ship to Canada though? These are such a great little thing. I was going to get just a few to see if it worked with mine etc, buuut, it has no other option for country. Bummer! I’ll search elsewhere! Or hey- I could always have you order them for me- ha! Ok ok, Surely they’re easy to find. I’ll see what an alternative might be and share if anyone else wants to know. ooooo sorry! I actually bought mine in person, the nearest city to me has a Stokes Store in the mall! I use a repti-rock as well!!! It works really well for my 2 little guys they can get into the bowl eaisly and they can't drag it around. Here are a few for sale online that are really good quality and very useful. I do have the food and water dish combo, but the one was so shallow that if anyone moved the water there was a low spot that made it leak out pretty badly. They just aren’t deep at all I didn’t think. Mine aren’t at least! Also, am I imagining this or did I read it somewhere else? I thought they were supposed to have it deep enough they can submerge or close to it, as long as they have a way to climb out as well? Is that a ‘should’ or an ‘ideal condition’ or a ‘just if you can’ on the scale of important needs? Water dishes need to be deep enough that they can submerge. These are what I use for food dishes. Where are you located? I am sure we could work something out, not sure the cost of shipping tho.